I recently watched the mother of all demos from 1968 which did an excellent job of showing how computers can be personal. Something that stood out to me was the mouse. This device has remained pretty much the same since 1968. The inventors couldn't even remember who first called it a mouse and they said they had created about 5 different devices to help a user point at things on the screen but everyone in the lab preferred the mouse. About 12 years ago I had the opportunity to watch an adult try and use a mouse for the first time. It looked incredibly awkward and frustrating. What is it about the mouse that makes it a good user experience? If you disagree that the mouse provides a good user experience then why do people seem to prefer it over other pointing devices? One final question, what would it take to make a computer mouse obsolete? The mouse position on the mouse pad is highly analogous to the position of the cursor on the screen. Two-dimensional movement of the mouse on its resting surface translates into two-dimensional movement of the cursor on the screen. The user can take hold of the mouse and can release the mouse without affecting the position of the cursor. Beginning to use the mouse does not reset the position of the cursor (unlike touch screens). Slight movements of the cursor can thus be effected by slight movements of the mouse. Rapid movements of the cursor can be accomplished with precision (unlike a joystick). Once a user is comfortable with the mouse, moving to a specific point in two dimensions becomes very quick. Take note of the quick and accurate input employed in first-person shooters. There is nothing to hold up, so the hand can be at rest when using the mouse (unlike a pen). In addition, the cursor can be moved across the screen a great distance without needing to move one's hand very far (and the movement/acceleration rates can be configurable). The mouse is separate from the screen, so using it does not obscure the display apart from the pixels of the cursor, which are arguably part of the display rather than part of the input (cursors are also used when editing text on a touchscreen, for example). The pressure exerted to click a mouse button is perpendicular to both axes of movement which minimizes unintentional input (trackballs are even better at this, but pressing a button on something like a Wii remote is difficult to do without also causing the cursor to move). It was more scientific than one might think. At its inception the mouse was found to provide better speed-accuracy than light pens or joysticks. This is why the mouse was chosen for use in the original direct-manipulations user interfaces. The mouse’s superiority has since been replicated with other input devices, such as styli and trackballs, justifying it’s continued use today. These findings were documented at a time when the mouse was alien to most users, so the mouse’s superiority cannot be attributed to it being ubiquitous and thus very familiar. There is just something neurological and biomechanical about it that makes it better. It requires larger targets so you cannot fit as much interactive information on a screen. It can mean the hand occluding the screen. It requires more motion to select things distributed around the screen, which can be tiring. A mouse, in contrast, has gain (I only have to move my mouse 3.5 inches to slew the 25.25" breadth the my desktop monitor, yet I can still highlight the letter "i" in this answer). The display position must compromise between easy viewing and easy touching. With a mouse I can keep eyes up and my hands down for greater comfort, rather than hold my hands in the air, or bend my spine down. You can’t incorporate physical buttons or other controls that provide flexible input and tactile feedback. Touchscreens are also more intuitive than mice, which is why we first saw them in kiosks. The non-intuitiveness of the mouse was clear to me as well from watching an adult first try a mouse in the early 1990s. As another datapoint, no one has made a successful cat game with a mouse interface, ironically. However, “non-intuitive” in this context means “non-familiar,“ so it’s less of an issue today since mice are so ubiquitous. A mouse is intuitive in the sense that once you learn it, it's easy and never forgotten. Touch remains a serious competitor for the mouse. However, for most uses, a mouse is better, if (a big if) you have flat stable surface to put the mouse. Unless someone comes up with something completely new, the mouse is unlikely to be replaced for the kind of tasks it’s currently used for. What would be complete new? What could make a direct manipulation UI easier? If anyone knew that, it would be here already. Maybe something like a glove with force-feedback? Don’t look at science-fiction shows for the future (except for maybe what not to do). SciFi shows hate mice because there is too little motion (the gain again), and therefore too little drama. They want the actor to make big motions. And they like speech so there is dialog. So, I wouldn't say the mouse 'beat' it. It's certainly the primary input method on most systems, but the concept of the light pen is still around. As for why the light pen is not the primary input device, well, it is--at least becoming increasingly so as we use touch screens. It's your finger. Your finger is now what the light pen was a half-century ago--a way to interact directly with the screen. Prior to today, however, most users needed to interact with what was shown on screen--but not the screen itself. Mice were more ergonomic and cheaper for that task, hence we all have mice now. jpmc26's comment got me thinking of a way to sum it up. Perhaps one way to put it is that direct input (ala a stylus) has always been the preferred means to interact with elements on the screen, however it was never all that practical until said screens have become adjustable and portable. The mouse was a 'temporary' compromise until we figured out how to shrink our displays. Everything is hard when you use it the first time. It's hard to use a bicycle if you haven't tried it before, hard to ski if it's the first time, as well as find the pedals gas, break and gear in any vehicle for the first time. Still, we use the pedals in the car, and the mouse as pointing device. Probably, and without any scientific proof, because this was the way it was first developed. Douglas Engelbart did something no one ever thought about more than 50 years ago which was truly amazing. Second, there are no real competition of the mouse. Yes, Apple has tried and come very close on there computers with its touch pads. The same with touch controls. But neither of these come close to the accuracy you can have with a mouse. Even on Mac computers, designers and illustrators use a mouse to point to that very specific pixel you need to change. This can't be done (today) on a touch pad or touch screen (unless you zoom in to the extreme, and lose context). What is it about the mouse that makes it a good user experience? A mouse is very precise. It is controlled near a keyboard, which allows for quick switching from pointer control to typing, and it utilizes your wrist and arm allowing your fingers of your hand to be free for extra controls. A mouse gives the user options that other controls don't have. You can use as far as your arm can reach to move the mouse, which allows you to have more inches per pixel than a track pad (Say a track pad is 4 inches across, either more 'resets' of picking up your finger are required compared to a mouse OR each cm needs to move the pointer more pixels making it more difficult to be precise.) Your free fingers also give you access to more buttons than any other device except a joystick, which has issues with precise movements since the cursor doesn't stop until you reset the stick back to neutral. While a track pad does allow for multi-finger controls, such as two finger drag to scroll the screen, or squeeze/widen to zoom out/in, the mouse can do these as well through the scroll wheel (sometimes requiring a modifier button to be held). A stylus, such as your finger, is great in that you don't need a flat surface and it is always near you. Further it is easy to learn since it tends to be intuitive at the basic level. However it falls apart as you desire to do more complicated controls. Say you want to hover the mouse over an image to see it's title, for a mouse you just move the pointer, but for a touch screen you need to somehow indicate that you are moving the pointer but NOT clicking or dragging anything. Not being able to easily separate moving the cursor and clicking the cursor makes precision with a stylus to be worse than with a mouse. Some websites/browsers get around this by creating a zoomed in sub window when you click a link near other links so you can make a good selection but it is still an extra step not needed by mice. Further, the stylus method has the built in issue of you obscuring what you are clicking. You typically are looking at what you want to click on, but the act of clicking on it obscures your vision of what you are doing! The only thing that will make a computer mouse 'obsolete' would be direct brain to computer interfaces that are portable and universal. Until then, stylus's will always have the issue of obscuring what you are looking at. Trackpads will always have a smaller size to screen size ratio than possible arm length to screen size ratio. Joy sticks will always require returning to 'neutral'. However, if you are performing actions that can be done with only the mouse movement, scroll wheel and left click (browsing the web) on a device that is small enough to be portable then the stylus is perfect and is better than the mouse. You no longer require a flat surface, the complex actions are not being used, 'obscuring' your vision typically only happens when you are changing screens anyway, you always have a stylus with you etc. If you are performing more complex actions and require frequent typing, or if the screen is not portable or close enough to touch (connected to a projector possibly) but you also don't have a large flat surface for the mouse then a track ball might be best. If you don't want to carry a track ball or learn to get used to them, most laptops have built in track pads that would be the best option. Currently, there are many ways to control a cursor on a screen. Every one of them has their own advantages or disadvantages in certain circumstances. Even with direct brain to computer interfaces, I could definitely see people not wanting to hook their brain up to a public computer and risk getting a brain virus or something. In which case any current device would be superior since they don't include getting your brain corrupted. Precision with minimum effort is one of the main reason why mouse is so successful. There are other reasons, of course. For instance, mouse become more influenced when personal computers were arising. It was the solution but why? At that time, personal computers were placed in office and business environments. They were on a table and there are plenty of space for expanding units. These devices are designed in office environments. Sitting posture - main posture of office worker - Between laying down and stand-up position. Less complex - technological development, carrying a (x,y) signal with a cable was easier than creating a grid. A good design solution shall be always connected within its environmental context, the real user and his needs. Todays computer definition is a bit different and mouse slowly integrated with another forms, especially after touchscreen boom. 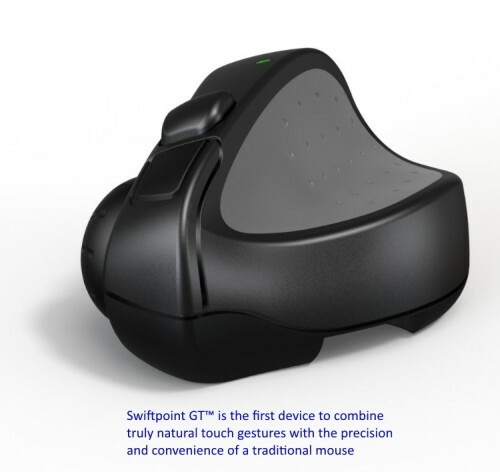 Currently, there is a new product for computers http://eu.swiftpoint.com/, which takes the advantage of mouse and uses the touch action movements. Mouse types are not the same. A mouse is pointer but you may need different pointers in different environment and context. A gaming mouse can be preferred while gaming, a cad mouse will work better when designing 3d model, and a small laptop mouse will be the best choice if you have a small bag. Mouse(tools) can have other intentions in itself for creating a better experience. I think that mouse is going to be evolve into something upcoming decade. Small form devices are going to be accepted by people because pc is no longer staying on a desktop but moves with people. My use of a pointing tool is almost entirely for manipulating GUI objects while using a device for reading and writing, rather than for gaming or drawing. I have tried all the common pointing tools, and for me, as well as for several other people I know, none are as good as the mouse. My guess as to why is that one's arms and hands are extensively wired with neurons for sensing and reporting their position, and we have been practicing since birth to use this feedback to move and position our hands with precision, and without having to look. Trackballs and joysticks do not make use of that feedback, and the 'pencil eraser' (trackpoint) that IBM put on its laptops translates force to velocity, which is not an analog of any action we perform frequently in real life. The gestures have to be overloaded to capture clicks, and I keep triggering inadvertent responses. I find it easier to make precision movements on a firm horizontal surface than on a near-vertical screen at reading height and distance. This does not, of course, apply when using a tablet. Styli avoid point 2, and for purely pointing on a tablet, I find them very easy to use. Furthermore, they are, by far, the best for drawing, though I would like them to have the same friction feel as a pen or pencil. They also are, like mice, physical objects, and I think I am more in tune with manipulating physical objects than abstractions. I have used touchpads up to the size of those for Macs, but they are all too small to map a position on the pad to a position on the screen and so don't take advantage of one's sense of hand position; in fact, they work like trackballs. Touchpads with buttons avoid the gesture-overload problem, but unlike mice, those buttons are not at your fingertips. Because mice are subtle. It was the easiest transition in a world of keyboard-only computers. You can poke the occasional key with one hand while using the mouse with the other hand. You don't have to sit closer to the screen. The mouse just sits there innocently to the side of the keyboard. You can also be essentially asleep and operate a mouse. The interaction isn't nearly as physical as a light pen or even a keyboard. I recently broke my forearm very badly and hurt my wrist, and it was still pretty easy for me to do my job (developer) by turning the sensitivity all the way up and using just my fingertips. Although most of the other answers probably have some degree of truth to them,I don't think anybody mentioned that it may have to do with the mapping of the movements of a mouse to the movements of the pointer arrow. With a mouse, you have span a whole 24 inches screen of space with just a small, 4x4 inches mousepad. This greatly saves effort on the part of the user. With pens this is more difficult and, in a touch screen, you would have to move your hands and arms 1 meter if you want to access a point in the screen that's 1 meter apart form you. This doesn't scale well at all. Price - mouse was relatively simple to put together, connect it to a computer and after that it was very easy to mass produce. It was, after all, mostly mechanical design. Ease of use and precision. First time users required very little tutoring, as the using it was very intuitive. Non-OS functionality offered high precision and speed. Introduction of mouse to GUI eliminated need to remember any keyboard commands. You still had the advantage if using keyboard, but you didn't have to. As there were (and are, obviously) better solutions than mouse (I'm partial to trackballs, however not for FPPs), it still won. Not always best solution wins, more often than not price is most important. Back then computers were expensive and anything that helped sell them to Average Joe was worth weight in gold. As for the last question. My personal bet is voice interface. Nothing else cuts down on time and cost. However that basically requires, for best performance and experience, an AI. No voice recognition software comes even close to desired functionality (which is adapting to user, not other way around). Something no-one else has mentioned is the fact that mice are cheap and simple. Money is always a major driver. The question is not "why is the mouse better", it's "why did the mouse beat its various competitors". Add "cheap and simple" to the functional merits already thoroughly examined and you have an unbeatable combination. I somehow do not like the learning that a user has to do before using the mouse. Understanding the movement and the impact on the screen. For me best pointing device would be my fingers. The movement comes naturally, and there is not learning curve for it. In 1968, computers were not as natural as they are today. I believe its high time, touch screen should become the primary pointing device. Not the answer you're looking for? Browse other questions tagged mouse hardware or ask your own question. Why are keyboards still the predominant input device? Is there any research into the cost of switching between using a keyboard and a mouse? What are the costs of forcing a switch between mouse and keyboard? Should Keyboard and Mouse stay next to each other? Why the hardware button of mobile devices is not placed at the front?